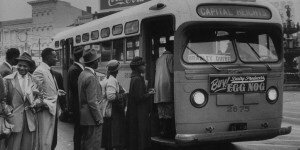 Most people know the story of Rosa Parks, the black woman who refused to give up her seat on a segregated bus in Montgomery, Alabama and whose action helped launch the 1955 Montgomery Bus Boycott, a key moment in the black freedom struggle many think of as the spark that brought the civil rights movement to national and global attention. But most have never heard of Georgia Gilmore, one of the thousands of African American women and household workers whose support made the Montgomery Bus Boycott a success. 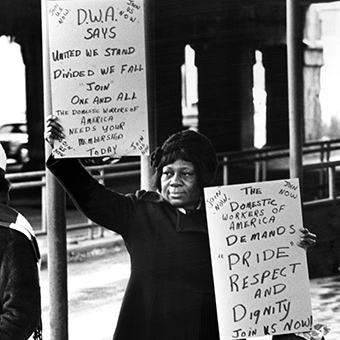 Georgia Gilmore, a single mother of six children with no formal education, worked for white families as a cleaner, a cook, and a nurse. When the boycott started, she founded the Club From Nowhere, an underground organization of maids, service workers, and cooks who prepared and sold sandwiches pies and cakes, and who collected donations in the service of black freedom. Gilmore’s visionary activism became an example for other neighborhoods, other communities. When Gilmore’s employer found out about her political activities, he fired and blacklisted her. Martin Luther King, Jr. (who was a pastor at a local church and an active member of the NAACP) helped her turn her kitchen into a “restaurant” and it became a hub for people involved in the boycott. Her stuffed pork shops, meatloaf, collard greens, fried fish and sweet potato pie became a conduit for political connection and for political action. Her kitchen connected all of kinds of people in the civil rights movement—people of all races, classes, and professions, including clerical workers, politicians, and professors. King himself often held secret meetings at her home since he could trust her and her food. Presidents Lyndon B. Johnson and John F. Kennedy ate in her kitchen. Unlike their representation in popular culture (think: The Help) household workers played critical roles at key moments in the civil rights movement. Georgia Gilmore is a leader and a visionary.